(CNN) -- Serena Williams regained her world No. 1 women's tennis ranking after cruising into the third round of the China Open on Tuesday. The American will displace Dinara Safina when the rankings are released on Monday, having crushed Ekaterina Makarova 6-3 6-2 to avoid any repeat of the Russian's embarrassing exit 24 hours earlier. Safina's defeat by world No. 226 Zhang Shuai meant the unheralded Chinese wildcard became the lowest-ranked player ever to beat a No. 1. Second seed Williams surrendered her place at the summit to Safina in April, but now has the chance to add to her career total of 72 weeks at the top. The 28-year-old will next face either Russian 13th seed Nadia Petrova or Slovakia's Daniela Hantuchova in the last 16 in Beijing. "Obviously I'm happy to be there because I've worked so hard this year to get there. 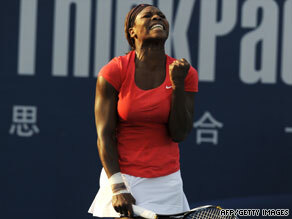 I think I've earned it," Williams told reporters. The winner of that match could face another former world No. 1 if Maria Sharapova can continue her resurgence. or Jelena Jankovic. The Russian moved into the last 16 on Tuesday after a marathon three-hour victory against ninth seed Victoria Azarenka of Belarus, winning 6-3 6-7 (5-7) 7-5. She could have been playing former world No. 1 Jelena Jankovic for a place in the quarterfinals, but the Serbian eighth seed crashed out 4-6 7-5 6-2 to Peng Shuai of China. Fourth seed Elena Dementieva set up a clash with Chinese 16th seed Li Na after beating Hungarian qualifier Melinda Czink 6-4 6-3, while her fellow Russian Vera Zvonareva also went through. The seventh seed will next play Flavia Pennetta after beating the 10th seed's fellow Italian Francesca Schiavone 6-3 6-0. French 14th seed Marion Bartoli set up a clash with Safina's conqueror Shuai by crushing unseeded Russian Alisa Kleybanova 6-2 6-3.